Logitech introduced an innovative multi-device Bluetooth keyboard, the Multi-Device K480, back in 2014. The K480 could be configured for use with up to three different devices, and definitely stood out in the crowded I/O peripherals market. Our wish-list for a follow-up product included an integrated trackball or touchpad and ability to use such multi-device peripherals with a wider range of PCs (not just the ones with Bluetooth capabilities). Both products retain the important characteristics of the K480. They can be paired with up to three different host devices and easily switch between them. The hosts can be Android, iOS, Mac or Windows devices, and the keys in the keyboard get automatically re-mapped depending on the host OS. Similar to the K480, the K780 has Mac / iOS inputs printed in grey on the keyboard. Both the mouse and the keyboard have explicit on/off buttons in order to conserve battery life. The two products together address many of the shortcomings of the K480 from 2014. The important features / changes are summarized in the list below. The wider K780 keyboard allows for compatibility with more devices (including the iPad Pro in portrait mode) when it comes to placement in the cradle at the top of the unit. The K780 is also heavier and more sturdy compared to the K480. The keys in the K780 are easier to type on and provide a better usage experience compared to the ones in the K480. The mouse contains buttons and gesture support that make it ideal for use with tablets as well as PCs. The addition of a USB receiver to both units indicates that Logitech is targeting the new devices towards PCs also. The K780 and M720 Triathlon are sold separately. Both of them come with their own Unifying Receivers. For use-cases that don't involve the USB receiver, both units have compartments to safely stow them away. In our review process, we first connected the M720 Triathlon to a PC with its USB receiver. 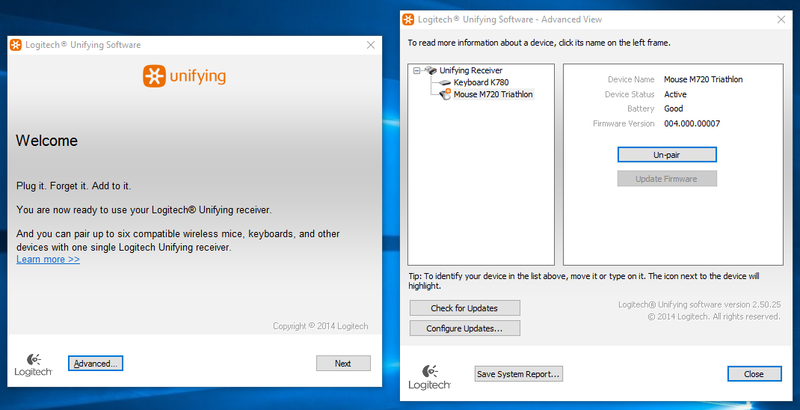 After installing the Logitech Unifying Software, we were also able to pair the K780 without using its USB receiver. The Logitech Options software enables users to configure / alter the behavior of the configurable keys of all the attached compatible Logitech devices. The Unifying Receiver program can also be triggered from within this interface. The battery status of the devices can also be viewed through this program. The K780 options include the ability to keep the keyboard always in the Windows layout and the option to use the F1-F12 keys as standard function keys (without using the Fn. key qualifier). The configurable keys include the Home button (F4), Right Click (F5), Back (F6) and the Search button (next to F12). They can be mapped to a variety of Windows functions / programs such as closing windows, Cortana, Calculator etc. The M720 Triathlon is marketed as a 8-button device. Two of them (the one behind the scrollwheel that controls the rate at which it moves, and the one that switches the host device to which the mouse is paired) can't be remapped. Everything else can be configured using the Options software. The left and right buttons can be swapped. The pointer speed can be finely adjusted and the scrollwheel direction can also be swapped. The mouse also has a gesture button below the three raised buttons on the left side. The scrollwheel can be swayed right or left for horizontal scrolling (on mobile devices, that acts similar to swiping right or left on the touchscreen). Along with the device change button, we also have the Forward and Back buttons on the left. The scrollwheel can itself act as a middle mouse button. All of these can be mapped to one of a variety of Windows actions (same as the list available for the K780). 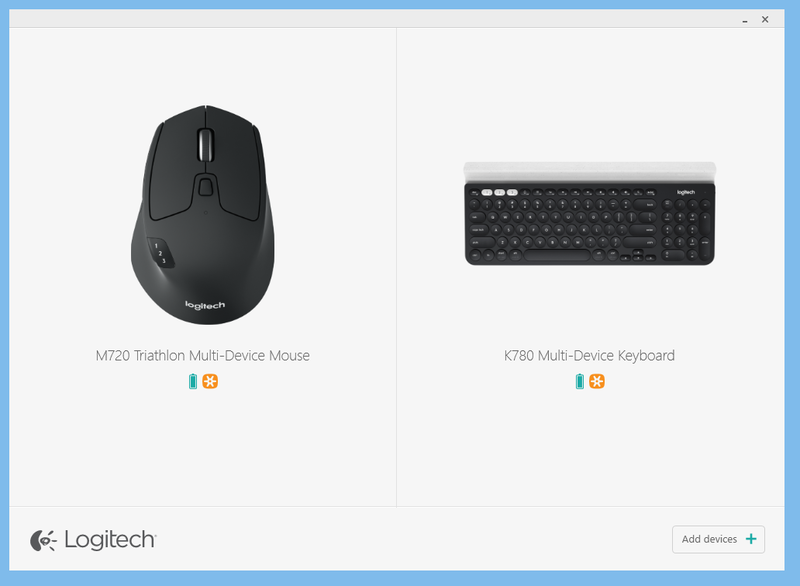 The Logitech K780 and M720 Triathlon are a great addition to the set of multi-device I/O peripherals from Logitech. They work as advertised, and there is really not much to complain about. As mentioned earlier, the keys of the K780 are a definite improvement over the K480. Evaluation of keyboards and mice targeted towards day-to-day / casual usage is an inherently subjective exercise. In the table below, we compare the specifications of the K780 / M720 Triathlon with some of the other keyboard / mice combos that we have evaluated with a similar approach before. Some subjective scores have also been provided. (Mouse) 2.91" x 4.53" x 1.77" 14.40" x 4.0" x 0.65"
Touchpad Dimensions (Diagonal) N/A 3.7"
While it is difficult to find scope for improvement in the M720 Triathlon, the K780 can be made a little more attractive with full-height arrow keys (that would go well with the PC use-case). The K780 multi-device keyboard is priced at $79.99 and the M720 Triathlon mouse is priced at $69.99. The K480 was a Bluetooth keyboard that fulfilled a niche market need. With the new multi-device models, Logitech is hoping to service that market with products that are better suited for the allied use-cases, while retaining similar price points.